perhapablog... and other ramblings: washington dc con and...what the heck it THAT?! another reminder about the washington comic con this sunday--father's day--at george martin university in fairfax! frank cho!! jim starlin!! larry hama!! rich woodall sent me this link last week from the always curious, always on the cutting edge io9 website, but i couldn't post it right away as i was wrapping up all the heroescon reports. Annalee Newitz — Last year, people in the small Mexican town of Chiquimitío were startled by the arrival of this bizarre creature. They took a few pictures and a short cell video, but this remains one of the clearest images of its head. Unfortunately we don't have enough evidence, beyond a few blurry pictures, to ever know for sure. 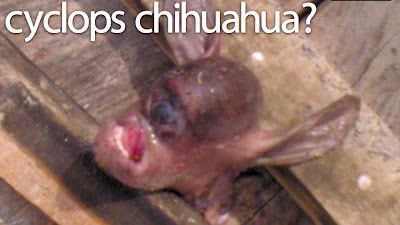 But there are a few theories, including that it's a cyclops-eyed chihuahua. Chiquimitío, a town of approximately 1,500 residents, is a small community some two thousand twenty meters above sea level, quite close to the city of Morelia. And that's where some local residents encountered a strange creature, small and walking on all fours before standing on two legs. They described the creature as having thin arms, legs and torso, covered with very little hair. Unfortunately, the few witnesses to this event were gripped by fear, and threw themselves against the unknown entity, lopping off its head with a single blow and throwing its small carcass to the local dogs, which devoured it almost immediately. It should also be noted that Chiquimitío is a farming community, and it is customary for residents to carry machetes wherever they go . . . It should be noted that we first thought it could be case of cyclopia - a congenital deficiency characterized by a single facial orbit visible on the face of living creatures — that is to say, a single eye — accompanied by cranial deformation and the absence of a nose (also known as holoprosencephaly) and that the creature's physique, and its similarity to a dog of the Chihuahua breed, could have indeed been an adequate hypothesis. However, a situation that also prompts reflection is that one of the characteristics of cyclopia, while it can affect any living creature, it is evident in approximately 1 to 3 per 1000 births. This low percentage is either stillborn or dies shortly later. this is the only picture that was released? i don't know about you, but this kinda looks like an old chicken leg to me with some meat left on the bone to dry out and then doctored to look like a face. anybody...? also, i guess the new go-to when these armchair cryptozoologists are stumped is "chupacabra!!" Looks like a bat with an underbite and problems with his complexion. And he tried to climb the shelves at the library and they all fell over on him like dominoes. I have to agree with Matt on this one. My first thought was "bat" .. my second thought was "OMG - so you see something different and you immediately go for your machete and chop off it's head?!!! Was it even big enough to be that scary?!! What if this was a friendly creature from outer space somewhere - now we've gone and killed it and started an intergalatic war. sheesh. Great job citizens of Chiquimitio"